“As the technology is developed, autonomous driving could provide driving opportunities for the physically challenged or enable the elderly to continue driving longer. This will be vital as many nations experience an aging population.” ~ William Clay Ford, Jr.
A light bulb for $9.99 by Amazon can be controlled by Alexa and Google Assistant. WHAT IS SENGLED ELEMENT CLASSIC A19 SMART LED BULB? With the smart speakers surfacing and getting popular, every one of us wants our house to be a smart home. Well, if you are looking a lighting solution without breaking your bank, then Amazon has a product for you. Sengled Element Classic is an economical way to get a smart lighting solution for your home. The product is available for $9.99 on Amazon. DO WE REALLY NEED A DIGITAL ASSISTANT CONTROLLED LIGHT BULB? Well, it seems convenient for people who don’t want to get out of bed and turn on or off the lights just by their voice. But do we really need this smart LED light bulbs? Sengled light bulb not only provides voice control integration with Amazon Alexa or Google Assistant to control the lightning at your house with your voice. It has other amazing features as well. It gives you full control whether you are at home or out, just install iOS or Android app and set the lightning according to your preferences. It also helps you to save energy, say if you forget to switch off a light at your house, do it remotely. These LED bulbs save approx 80% of energy as compared to incandescent lighting. The kit and bulbs come with three-year warranty and can last for more than 20 years and are Energy certified so you don’t have to worry about a thing. Seems cool, right? So, buy it and make your home a smart home without burning a hole in your pocket. 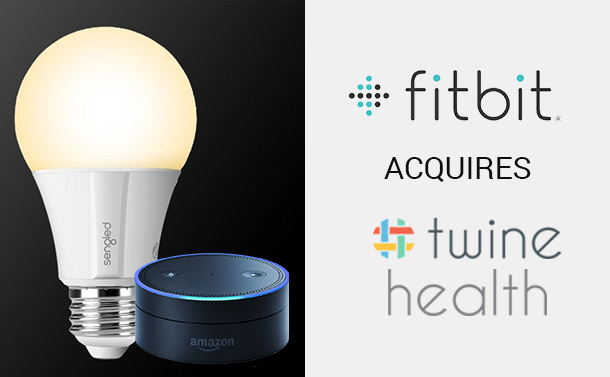 Fitbit acquires Boston-based software startup, Twine Health. WHY FITBIT PURCHASED TWINE HEALTH? The name ‘Twine Health’ might not ring a bell if you’re not that into digital health. Twine Health is a small Boston-based software startup. It trails chronic disease and connects patients with doctors and health coaches for counseling. The setup was founded in 2014 and the aim of the platform was to create the most effective and efficient healthcare experience in the world. Fitbit acquired Twine Health and after the acquisition, almost all the employees of Twine Health will join FitBit and Twine’s CEO and co-founder John Moore will be Fitbit’s medical director. Fitbit said that the takeover would not change anything and Twine customers would be able to access the platform. IS THIS MOVE INSPIRED BY THE COMPETITORS? Well, this is not the first takeover by Fitbit. Last year, FitBit acquired Coin, Pebble, and FitStar. With this takeover and partnerships with digital health companies, it seems that Fitbit wants to dive in serious health-tracking.The company has also mentioned that it is working on getting a solution for tracking sleep apnea. Well, Apple and other competitors, working on taking the wearables and health tracking on them to the zenith. Moreover, there is a technology on which Apple is rumored to be working on. Fitbit is bound to work on the advancement of its own, hence the acquisitions. Fitbit is working hard to make its position in the market and beat the competition. The outcome will let us know the rest.